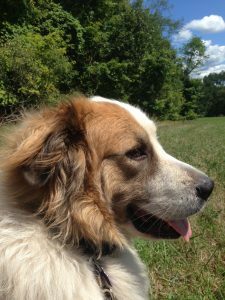 Klingberg Family Centers is pleased to welcome a registered therapy dog to our staff. Winston works with his handler, Lauren Pedersen, LMFT, in our school-based clinics. 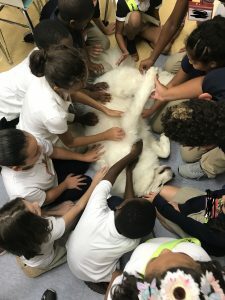 Winston’s superpower is helping people relax, and twice a week he puts that superpower to good use at a total of four New Britain elementary schools. Spending some time with a friendly dog can be just what children need to calm down during a stressful day. Winston helps students relax so that their stress does not continue to build up until it is unmanageable and debilitating. Winston spends time with staff, too. Reducing stress for teachers and other school staff helps everyone, as it results in improved relationships with students. Winston loves his new job, and we love having him!